Home / FILIPINO FILMS / FILM FESTIVALS / SCREENINGS / Update: Inquirer Indie Bravo-Fully Booked Film Festival 2014 Present "The Best of Filipino Films 2013 Plus"
Update: Inquirer Indie Bravo-Fully Booked Film Festival 2014 Present "The Best of Filipino Films 2013 Plus"
The Inquirer Indie Bravo! 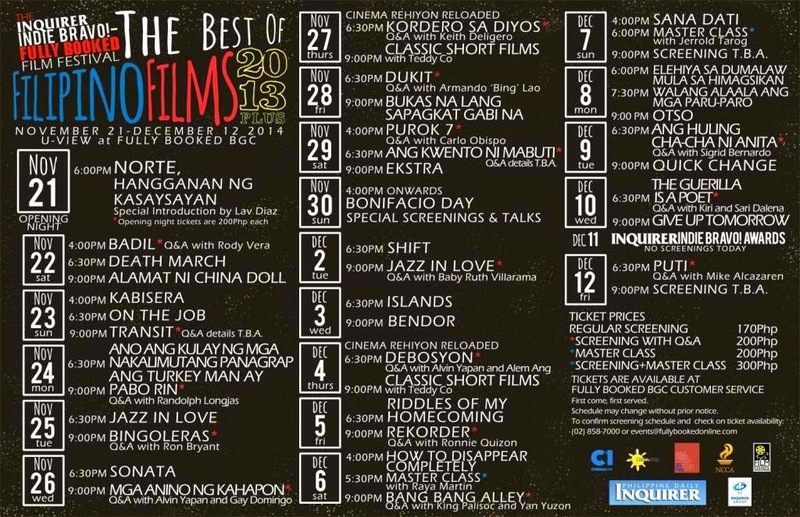 together with Fully Booked Bonifacio High Street bring you the best movies of 2013 in their upcoming Inquirer Indie Bravo-Fully Booked Film Festival 2014. The event will showcase some of the best short films and independent films shown last year in some of the most prestigious filmmaking competitions in the country. 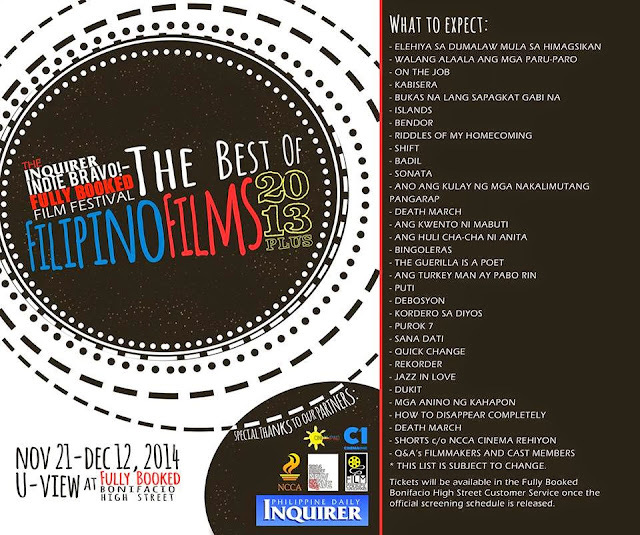 In partnership with the Film Development Council of the Philippines, MMFF New Wave, Cinema One Originals, Cinemalaya Filmmakers, CineFilipino, and the National Commission for Culture and the Arts, the Inquirer Indie Bravo-Fully Booked Film Festivals 2014 will be featuring critically-acclaimed movies and short films from 2013 in this once-in-a-lifetime event. The U-View at Fully Booked Bonifacio High Street will be the home venue for the movie screenings. The Inquirer Indie Bravo-Fully Booked Film Festival 2014 will be happening on November 21 to December 12. Stay tuned for the schedule of screenings here in MovieNews for this upcoming event. Below are some of the featured films that will be showing in this film festival. You may also check out the MovieNews facebook page for the screening schedules or Fully Booked Facebook Page for more details. See you soon! Below is the screening schedule of films in the Inquirer Indie Bravo!-Fully Booked Film Festival 2014 from November 21 to December 12, 2014. If we see positive things in a movie we definitely have a positive impact. But this is hardly seen in today’s commercial cinema.